I was honored by the Redding Roller Girls and NRD HOF for my career in Roller Derby and accomplishments as a skater. 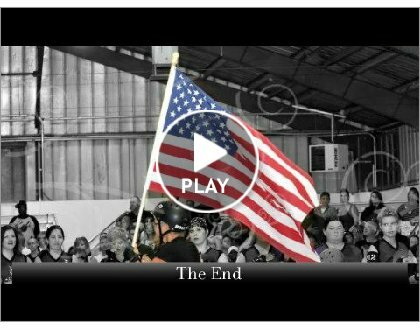 This video captures the excitement and joy I felt to be honored and to be a part of the great movement of Roller Derby today. Many thanks and much gratitude to everyone involved and who were a part of such an amazing day! During the NRD HOF Celebration & Warrior Reunion held Nov 13 in Philadelphia, Judy helped fulfill a dream for two fans touched by disability with a vision impairment. Watch and be blessed as Judy walks her friends David and Nanci around the banked track which is something they both aspired to do all their lives. Original Score 'Friends' performed by Victoria Robbins. Judy along with Philadelphia Warriors' team-mates once again skating on the Banked Track together during the NRD HOF Annual Celebration and Warrior Reunion held in Philadelphia, PA - Nov 13, 2010. Look also for Judy Sowinski, Cindy Ogbin, Richard Brown, Skip Schoen, Jeff Hart and many others skaters from the past along with the new skaters of today. A silent slide show of pictures spanning my entire skating career with thanks to fans, friends and family who provided me with many pictures throughout the years. Enjoy! Watch my TV Interview during a practice session with the Redding Roller Girls that aired on KRCR out of Redding, California earlier this month. Listen to a Radio Interview which aired on WXPN radio out of the University of Pennsylvania in December 2009. Along with the audio is a short slide show reflecting on my skating career and ministry. To celebrate the birthday of Judy Arnold, the National Roller Derby Hall of Fame debuts its first ever 'Conversations with a Roller Derby Legend' DVD featuring an interview with the former Philadelphia Warriors' captain, a legend of the banked track sport and a beloved figure within the Roller Derby family. Hear me share at Joni and Friends Family Camp in July 2009. Clip of Judy receiving a Lifetime Achievement Award presented to her at half-time at her first Roller Derby game in the role as General Manager of the Orlando Thunder team in January 2009. This also marked Judy's return to Kezar Pavilion in over 40 years. Judy Sharing at the Philadelphia Warriors 40th Anniversary Reunion Dinner and the NRD HOF Weekend held in the Fall of 2007. With Judy as Captain of the Philadelphia Warriors from a game against the Los Angeles T-birds from 1974. Judy is skating as a Red Shirt in this game in California. Look for Judy Sowinski, Sally Vega, Cindy Ogbin and others. As Captain of the Philadelphia Warriors in a Game against the Canadian Braves from 1974 in Philadelphia. With Judy as Captain of the Philadelphia Warriors in a Game against the Canadian Braves from 1974 in Philadelphia. As Captain of the Philadelphia Warriors in a game against the New York Chiefs skated in Philly. Watch Judy challenge Bobby Riggs to a Match Race live on the Mike Douglas Show. Also appearing Judy Sowinski and others along with Ed Darian announcing the out-door race. Lots of fun! Match races made with a 16mm camera featuring Judy Arnold vs. Judy Sowinski, and then vs. Danny Reilly. Sorry about the poor video quality! Judy with Patti Cavin during a match race in the movie KC Bomber. Judy doubles here for Raquel Welch who can be seen in some of the face shots. Don't miss Judy in her Oscar winning performance as she got to say a few words in the 1972 movie KC Bomber when she wasn't skating for Raquel. Lots of Laughs! A special segment of Judy Arnold and Unpredictable Ann Calvello in this 1967 black and white broadcast shot in Hawaii. This is another classic game from Los Angeles in 1967 featuring the Los Angeles T-Birds and Chicago Hawks. Look for Judy wearing the number 32 for the Hawks. This is a classic game from Hawaii way back in 1965 featuring the Shamrocks bad girl Anne Calvello and her hench girls taking on the Warriors and Judy Arnold and the good girls. Skating clips reflecting on my skating career. Most of these clips are without audio until the last few minutes.